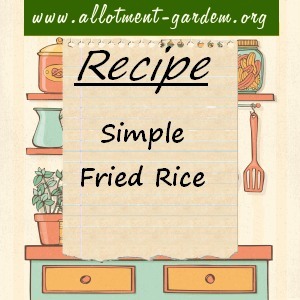 Simple Fried Rice Recipe Submitted by WW. Boil the rice and set aside and allow to go cold (or use cold leftover boiled rice). Beat the eggs with a little salt. Fry as an omelette, cut into 1” squares and set aside. In a wok or frying pan, over medium heat, cook the onion and carrot in a tablespoon of oil until softened. Add the bacon cook for 1 minute more. Add the mushrooms, peas and green pepper and continue cooking for a further 2 minutes. Add the cold cooked rice and stir well until rice is in separate grains. Add the soya sauce, then the egg squares. Sprinkle with the spring onions and serve. This is a quick, easy and filling dish. You can vary the recipe by adding, for example, prawns, chillies (if you want to give it a kick), leftover cold pork or ham, bamboo shoots or water chestnuts, or just let your imagination run riot. Another variation is to use cooked cold noodles instead of rice.